Good morning you precious pound puppies! It’s been a couple of weeks since a proper newsletter, but this is because the Funcom community team has been up to quite a lot since we last spoke. Hell, there’s been huge changes to the game itself in just the past week! The studio is in full playtesting and bugfixing mode at the moment, so this newsletter might not be as verbose as they’ve used to be. It’s all head down and work hard from here on out. Last week we rolled out Update 33 to PC, and Updates 32 and 33 to Xbox, bringing considerables changes to Conan Exiles. This included the new combat system, farming, the Map Room, updates to the HUD, updates to the Attributes system, updates to the Feats system, quick-looting, war paint, new crafting resources, and a ton of optimizations, bug fixes and crash fixes. You can find the full PC patch notes here and Xbox patch notes here. We also rolled out a quick hotfix for PC and Xbox to take care of some lingering issues. Now that we’re in the final stretch we are focusing exclusively on stability, performance and optimization in order to make the experience at launch as good as it can be. Also, remember that we’re wiping all the official servers on May 8th. This is to make sure that all players start on an equal footing and to clear out any old data or information lingering in the server databases. We’re not touching private servers, but we do recommend wiping your server if you’re a server admin. After the updates we’ve seen the number of server crashes on official servers go down significantly. We were also able to identify and fix several memory leaks and now the memory usage on official servers has been reduced. Currently we are profiling both Testlive and official servers to gather as much data as possible to isolate and fix more performance bottlenecks. We made some good progress already and we will continue these optimization efforts also after launch to give players a smoother experience. Besides server performance one other area we have focused on is the new decay system (which gets rid of abandoned buildings and floating placeables) to ensure building pieces and placeables (furnaces, chairs, torch etc) do not get removed incorrectly. We fixed several issues before this system made its way to Live and we fixed some additional problems in the hotfix. However, with the help of the Testlive community we found out that there was a problem with certain types of ceiling pieces: Whenever you upgrade from a sandstone ceiling it will get a different collision box which will cause any placeable on top to lose its connection and be considered a floating placeable (which will get removed on next server restart). We are fixing this once and for all for the ceiling pieces by making them have a unified collision in all tiers. Unfortunately the most incorrect one is the sandstone ceiling, tier 1, and everything that is placed on top of it will likely be lost when we roll out the fix. If you have lowered your placeable far enough into the ceiling, it should be fine. But to be safe you should make sure to place your placeables on a higher tier ceiling, or not on a ceiling at all (foundation, straight on the heightmap etc) until after the fix is rolled out. For PC, these will most likely not be the final updates. We still want to use Testlive to further test future patches and these will be rolled over to live when we’re satisfied with the performance. For example, The Purge needs some updating, as it is not at full strength, and isn’t working quite to our satisfaction. On Xbox there won’t be any more updates before launch. We’d love to patch Xbox more, but we can only have on cert process going at a time. We started certification of the launch day patch on Monday, meaning no other patches to Game Preview will be possible during this process. Thankfully you won’t have to wait more than two weeks to play an updated version. There have been two developer streams since the last community newsletter. The first one, which aired April 10, was a quick runthrough of some of the areas you can find in the new Swamp biome. We also answered viewer questions from the chat. 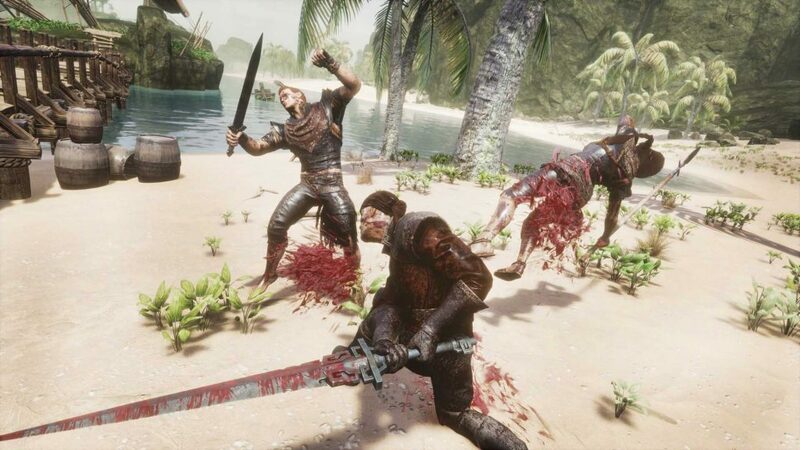 On April 20 we discussed combat meta and potential combat changes we’re considering for the future of Conan Exiles. Since we’re in the run-up to launch we’re up to a weekly schedule with the developer streams. That means that we’ll be streaming again this week and the next. We’ll also be doing a launch stream with all three community managers and whoever else decides to pop in and hang out with us. Going forward we are going to do some changes to the streams. We’ll still be playing Conan Exiles and keep you updated on what we’re doing with the game, but we might also take the odd Friday here and there to jump onto a community server or play a different game entirely. We’re workshopping it to figure out what works best for us. As you know, Conan Exiles comes with pre-order DLC. If you buy or pre-order the Day One Edition you get a key in the box that will unlock Conan’s Atlantean Sword in the game. If you buy the game digitally at launch (or already own the game in Early Access or Game Preview) you get Conan’s Royal Armor as DLC. In-game both will be available to you right from the start as crafting recipes. Finding and gathering the correct resources will be an entirely different matter altogether, but we leave that up to you. Once you have the crafting materials you can make the Atlantean Sword or Royal Armor just like any other craftable. However, you should be careful about flaunting such extravagant items. They are easily stolen if you don’t protect them carefully. That’s it for this week. Don’t forget that we’re streaming on Friday at 5pm CEST, and keep those eyes peeled for more Conan Exiles content coming in the near future. We’re incredibly excited about finally launching out of Early Access.